Not all countries allow you to transport children on the front passenger seat. Not every child seat is suitable for use on the front passenger seat. Volkswagen dealerships keep an up-to-date list of all authorised child seats. Only use child seats that have been authorised for your vehicle. The active front airbag on the front passenger side presents a major danger to a child. Transporting a child in a rear-facing child seat on the front passenger seat can pose a danger to the child's life. If a rear-facing child seat is secured to the front passenger seat, an inflating front passenger front airbag can strike it with such force that critical or fatal injuries may occur . Therefore, never use a rear-facing child seat on the front passenger seat when the front passenger front airbag is activated. Only use a rear-facing child seat on the front passenger seat when you have ascertained that the front passenger front airbag has been switched off. This is confirmed when the yellow indicator lamp in the dash panel PASSENGER AIR BAG lights up . If the front passenger front airbag cannot be switched off and stays active, do not transport any children on the front passenger seat . Items between the front passenger and front passenger airbag . Safety distance between the front passenger and front passenger airbag . 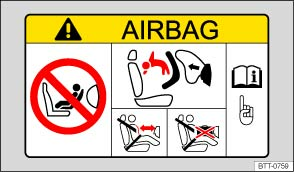 The front passenger front airbag must be deactivated when a rear-facing child seat is being used . The front passenger seat backrest must be in an upright position. The front passenger seat must be pushed as far back as it will go. In vehicles with height-adjustable seats, the front passenger seat must be as high as possible. The seat belt height adjuster must be at the highest setting. The child seat must be specially authorised by the manufacturer for use on the front passenger seat in vehicles with front and side or combined curtain and side airbags. Universal child seats in groups 0, 0+, 1, 2, or 3, as specified in ECE-R 44, can be fitted to the front passenger seat. Some child restraint systems have a support foot which rests on the vehicle floor. Child restraint systems with a support foot may be used on the front passenger seat. If a child seat is secured to the front passenger seat, the risk to the child of sustaining critical or fatal injuries in the event of an accident increases. Never use a rear-facing child seat on the front passenger seat if the front passenger front airbag is enabled. The child could suffer fatal injuries when the front airbag is activated as the child seat will be hit by the airbag with full force and thrown against the seat backrest. The front passenger front airbag must be switched off and remain switched off. The child seat must be approved by the child seat manufacturer for use on a front passenger seat with front and side airbags or combined curtain and side airbags. Follow the fitting instructions from the child seat manufacturer and observe all warnings. Push the front passenger seat back as far as possible and adjust it to the highest position, to keep as far away as possible from the front airbag. Adjust the backrest to an upright position. Set the belt height adjuster to the highest position. Always secure children in the vehicle in an authorised restraint system suitable for their height and weight.